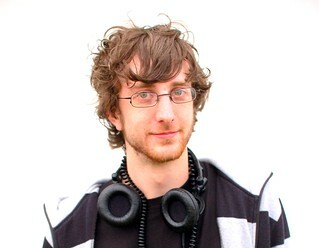 Peter is a 25 year old graduate student at Seattle University studying for a Masters degree in International Business. Just like his approach to business, Peter’s musical tastes are not easily categorized, as he appreciates music ranging from hip-hop to bluegrass. Peter has just finished finals for his fall quarter and is ready to emerge from his studying and enjoy some good music. He’s hoping to catch a show soon, and so he decides to go online to see if any of his three favorite bands (Bon Iver, Macklemore and – a guilty pleasure – Dave Matthews Band) are going to be in Seattle soon. Because he’s been so engrossed in his studies, he has barely kept up with any of these bands recently, so he also wants to know if any of the acts have new or pending releases to look forward do. And he’s also hoping there are streaming music options from the bands while he navigates their sites. Note: Macklemore was not in the original list of entertainment sites, but since the list of sites was so diverse it was hard to have a viable scenario which would apply to three of them. Peter starts with Macklemore, a local hip-hop musician. He knows Macklemore has recently played a show in Seattle in support of his new album (Peter hasn’t paid much attention to music lately, but his friends have all been talking about the new album). When he gets on the landing page, he sees a large promotion of the latest album, which he has already heard. He has to scroll down below this promotional image to see the main site content, where he sees a navigation link for “Shows.” He clicks the link, which takes him to the show schedule page. He sees a Seattle show in the list and gets excited – only to have the disappointing realization that this is the show from last month. The show page is listing all dates from the current tour, even ones a few months old (some of the past shows still have an link saying tickets are available, which is very confusing). Peter then navigates away from the show page to see if there is a way he can stream some of Macklemore’s music, especially the new album. He goes to the “media” page, where he finds music videos and show videos, but no option for constant streaming. He then clicks on the “blog” link, which takes him back to what he recognizes as the landing page. Since he hadn’t spent much time here in the beginning, he decides to scroll down to look at the information presented. He finds a link to the Macklemore’s Soundcloud page, which he opens on a separate tab and begins playing the song Thrift Shop. Back in the main tab of his browser, Peter navigates to Bon Iver’s site. Peter is met with a very dynamic page – instead of a simple background image, the background is a full music video. Peter pauses the Macklemore song on the other tab, hoping to hear some sound, but is confused why he doesn’t hear any. He looks for some indication there are music controls, but it appears the site is simply playing the video without any sound. He gives up and clicks on the shows link in the main navigation at the top of the page to see if Bon Iver is planning on showing up in Seattle anytime soon. Although the page is set up to show a tour schedule, there is no information. Peter waits a few seconds thinking that perhaps the data is taking a while to load, but there is nothing – not even a message that the band is not currently touring. Now slightly frustrated, Peter clicks on the Album link to see if there are any albums coming up soon. Seeing that there are no new or upcoming albums, he is disappointed. He glances at the top right and notices an odd red arrow, so he clicks it – and is finally presented with the controls for the site’s music. He unmutes the sound and is consoled by at least listening to a little bit of Bon Iver. Peter then resorts to the site of his guilty pleasure band: Dave Matthews Band. On the landing page, Peter is greeted with a rotating slideshow of promotions. One of the images is a promotion for DMB’s newest album. Peter clicks on it and a new tab opens with options to purchase the album. Peter decides to buy the actual CD, to add to his DMB collection. After buying the album, Peter closes that tab and goes back to the main tab, where he sees a jukebox control at the bottom. He clicks the play button but hears nothing. Exasperated, Peter decides to click an icon on the bar that indicates an external link. It opens a popup window with a jukebox for streaming music. When he presses play, Peter hears the familiar sound of Dave Matthews Band. Finally happy, he leans back and relaxes to the music. Sometimes, there’s nothing better than some good nostalgia. All of them have a navigation bar across the top of the page. The links are slightly different for each, but all include some version of links to 1) show/tour page, 2) some sort of news page, and 3) some sort of visual media (video and photography) page. Bon Iver has a dynamic background—literally a music video playing in the background as you continue to explore the site. The sound is muted by default, but it isn’t immediately apparent how to unmute, since the controls for the video are hidden and are only revealed by clicking on a inconspicuous indicator. It seems likely there are many users who never find the controls. The Macklemore site has the least “professional” presentation of the three sites. It appears to based on the Tumblr platform, and a large promotion for the latest album takes up the whole viewing space on first loading — one would has to scroll down to see any other content. It is also noticeably lacking a function to stream music (or music video in the case of Bon Iver) which browsing. The Dave Matthew Band is a more standard design, almost with a business feel. The landing page displays a slideshow of alternating promotional images for tour dates, albums, philanthropic activities, etc. 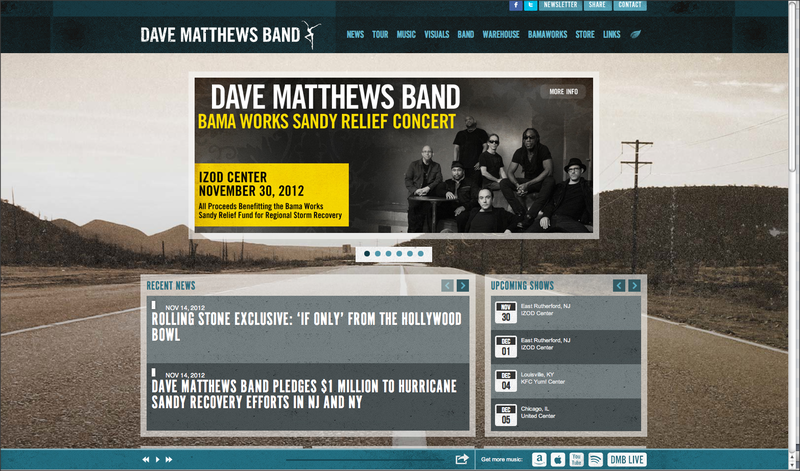 DMB also has a jukebox at the bottom edge of the view of the page, and an option to pop it out into a separate window. When the page loads, it isn’t obvious that muted sound is playing along with the background video. Controls are also hidden until mouse over. The Shows page has been obviously been set to display shows and touring info, however there is no data—the categories are empty. 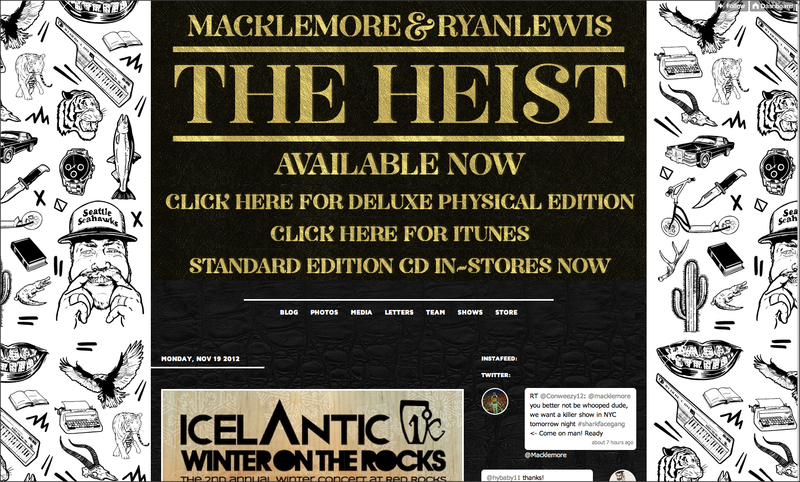 Landing page has a large promotional image of the lattest Macklemore’s album. Shows page gives a list of current and future shows in the Macklemores current touring schedule. It also provides a link to buy ticket. If there are none available, the link is replaced with a ‘sold out’ label. Media page provides music videos. On the landing page, there is a link to Macklemore’s Soundcloud page. There is no way of streaming music or video while exploring the site. There is no differentiating between past and current shows with past shows still offering tickets for sale. There is a prominent tour link in the navigation bar. The page separates the upcoming shows from the archived shows. This distinction is also revealed by a mouseover the link on the navigation bar. There is are jukebox controls at the bottom of the view window of the site. There is also an option to pop out the jukebox into a separate window. The landing page reveals that there is a new album. Clicking on the image navigates the user to the store. There is a ‘Music’ link on the navigation bar to a page listing all the albums release. Jukebox at the bottom doesn’t seem to play music until it is popped out into a separate window. Love the imagery – esp the opening illustration for the persona! (Nice CC credit).